Shipping is one of those interesting areas where two large business expenses, labor and carrier costs, interact with one another at high-speed and in very complicated ways. 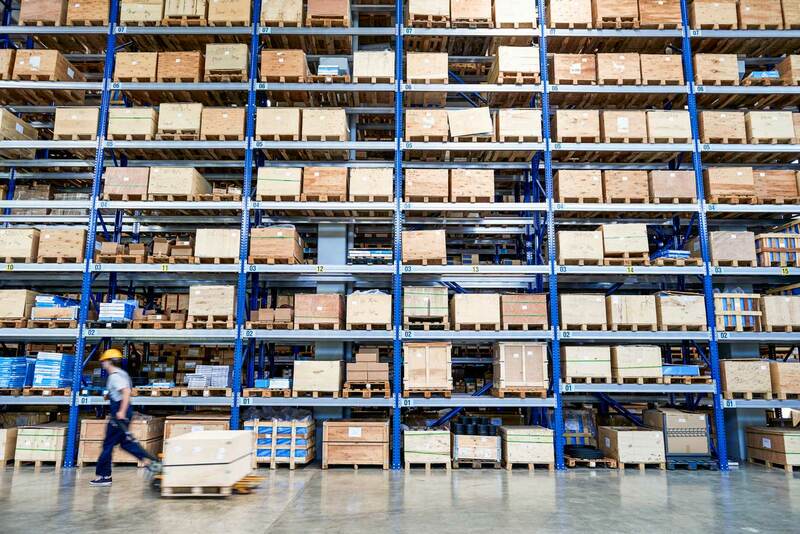 Because physically handling inventory to pick-pack-ship is very labor intensive and shippers are purchasing thousands or millions of dollars in carrier services each year, there are dozens of opportunities for both labor efficiency and financial improvements that can form the basis of a solid return on investment (ROI) for implementing an integrated shipping solution. However, many business leaders will simply not believe in an ROI model unless they take a very personal hand in identifying the variables, making the estimates, and doing the calculations based on their own personal experiences. 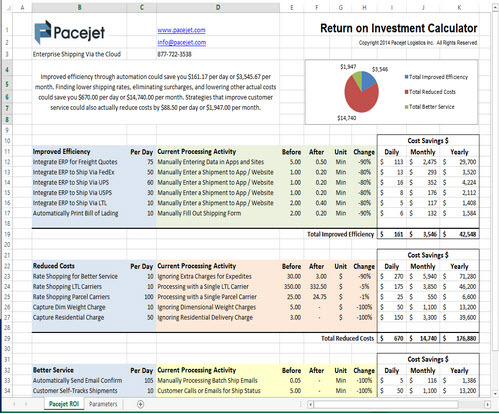 To help out, Pacejet developed a free, downloadable ROI calculator that shippers can use to plug in their own numbers, add their own variables, and end up with a simple Excel spreadsheet that points the way --- should we invest or not? Read on for more on calculating your own ROI for an integrated shipping solution. Download the Pacejet ROI calculator by clicking on the link or picture shown below to start developing a model for your business. You will need a copy of Microsoft Excel for the spreadsheet but no other special tools are required. After you download and open the calculator, you will see one tab labeled "Pacejet ROI" and another tab labeled "Parameters" as shown below. The parameters tab controls the details of the before and after changes (e.g. a task moves from 2 minutes to 5 seconds to complete) we expect for each variable in the model and also has a basic assumptions section at the top of the page with settings like your average cost of an LTL shipment or the average hourly cost of your warehouse workers . The Pacejet ROI tab summarizes the result into a financial impact statement by area and then a high-level summary of the overall impact at the very top of the page. To create your custom ROI model, all you need to do is change the variables in in the column under each of the three tables "Improved Efficiency", "Reduced Costs", and "Better Service", enter a transaction count in the "Per Day" column, and the model will recalculate a total result and display it at the top of the page. To take it a level deeper, you can change the individual variable deltas and add your own variables to each section of the model. 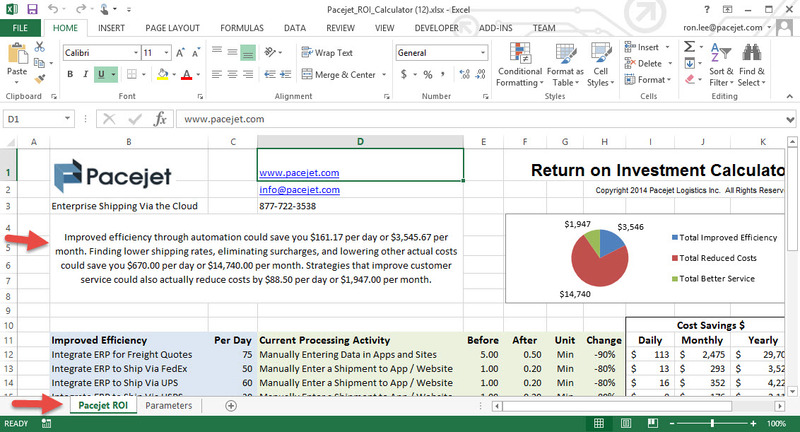 With the ROI spreadsheet setup and available, take a closer look at the Pacejet ROI tab and the "Improved Efficiency" column (a variable which has been selected from a drop-down list in the cell) and the column "Per Day" immediately adjacent to it (a variable which has been directly entered for this value). Scanning to the right on this same row, you'll find values automatically entered from the Parameters tab and a financial impact roll-up out to the far right on this table. So if your team is processing 75 freight quotes per day by manually entering information onto multiple websites or applications and it's taking them 5 minutes per quote, the new solution will reduce that time by 90% to 30 seconds per quote and the resulting savings in labor time will be $115 per day, or $2,475 per month, or $29,700 per year. This particular line doesn't try to take any credit for finding lower cost shipping services during the quoting process, it only takes into account the labor efficiency savings of speeding up the process from 5 minutes to 1/2 a minute. This is where using the ROI model gets interesting and personal. Don't believe the time will drop by 90%? Don't believe in the per-minute cost savings? The counter-argument is that the change is not zero, so your internal discussions can focus on what level of reasonable changes you believe can be supported by the new integrated shipping solution in your business context. If you prefer a "bottom up" or "minimalist" model, then create one or if you prefer a "best case" versus "worst case" profile then create both versions. The "Reduced Costs" and "Better Service" tables operate in the same manner, using a series of rows with selected variables and hand-entered Per Day transaction volumes. Notice that the Reduced Cost table does make estimates of cost savings with specific Pacejet functionality and uses a $ change estimate based on process changes. The Better Service table quantifies customer service oriented features and uses either a time (Min) or a cost ($) change for each variable. You can change out or remove any of the variables set by default in the model and even insert your own on the Parameters tab to extend the model. Hopefully a key thing you'll notice by working with the ROI model is that seemingly small improvements can really add up quickly with transaction volume. You might reduce an activity by only 30 seconds but if it's done hundreds of times per day, the savings from our integrated shipping solutions is hundreds or thousands per month. The same is true of cost reductions where a 5% reduction in LTL cost per shipment could easily drive $6k in savings per month with modest daily volumes. Another thoughtful discussion that often comes from ROI reviews involves attitudes about technology investments and how or even if they can improve efficiency in your specific business environment. For example, if your team doesn't truly believe that a shipping activity can be reduced in time by 50% then it doesn't matter what technology or product you evaluate or the vendor who might provide it. You might also find that a "Reduced Costs" rationale is not the primary driver in your total ROI but rather the "Better Service" area drives a stronger total return. Wherever you end up in the analysis, the review itself is helpful to focus attention on the key decision drivers that matter for your business. Interested in Help with Your ROI? 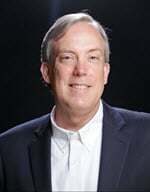 Want some help in developing your return on investment? Call Pacejet at 877-722-3538, email info@pacejet.com, or Pacejet.com for more information on our integrated shipping solutions.